Will the real St. Valentine please stand up? I was not aware that, in fact, there have been about a dozen martyrs over the centuries with the name Valentine. The one that is celebrated on February 14th is a person who died around A.D. 270. He is an officially recognized saint but not venerated by the Catholic church because his actual identity is in question. Legend has it that Valentine was a Roman Priest t a time when the Emperor Claudias was persecuting the church and was prohibiting young people to be married because the men were supposed to be concentrating on being soldiers. Valentine performed marriages in the Christian church and was eventually caught and imprisoned, tortured, and executed. The legend continues that while he was imprisoned, he wrote a note to the daughter of one of the men who had judged him guilty. It is said that she had been blind and he had healed her. He signed the note, "from your Valentine." And thus, the valentine was born! 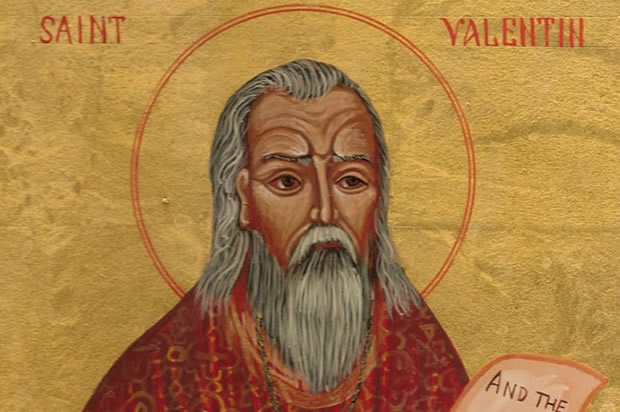 St. Valentine is called on to watch over the lives of lovers, engaged couples, marriages, travelers, beekeeping, those afflicted with epilepsy, plague and fainting. If you ever go to the Basilica of Santa Maria in Cosmedin, Rome, you can see the skull of St. Valentine... and bits of his skeleton are on display in reliquaries all over the world. Another such place is Whitefriars Street Church in Dublin, Ireland. I went into the reliquary at Notre Dame - I wonder if a piece of him is there?